It seems that First Lady Michelle Obama's push for healthier foods has rubbed off on someone you'd assume to be the most committed dessert fan: her own White House pastry chef. After seven years creating delectable desserts for the First Family and a whole host of foreign dignitaries, Bill Yosses is hanging up his apron. He's headed to New York to be with his husband, teacher Charlie Jandusay Fabella Jr., and to teach children and adults about healthy eating. Yosses and his husband wed in Washington in 2011, but in the whole 11 years the couple has been together they've never lived in the same city. In an interview with the New York Times, Yosses said that Mrs. Obama sparked his interest in the relationship between food and health. Since the Obamas came into the White House, he's been experimenting with novel alternatives to butter, cream and sugar, such as fruit purees and agave. He's even tried his hand at adding whole grains to his desserts. 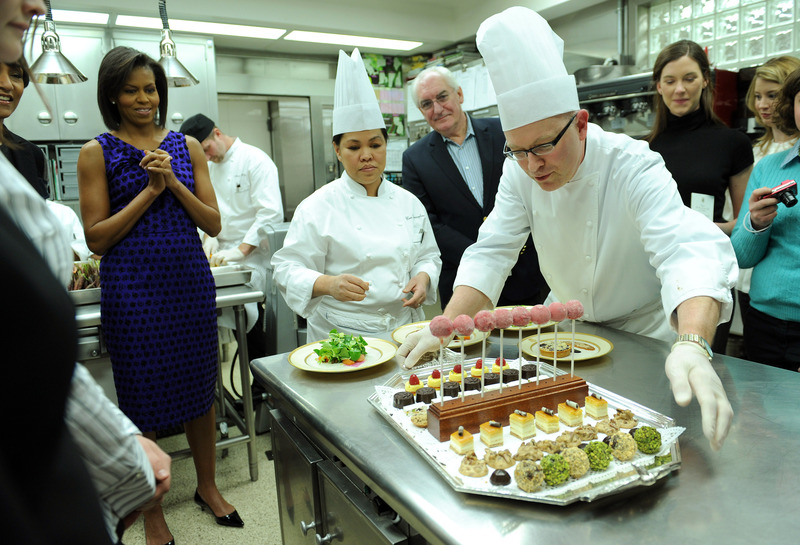 Yosses was originally hired as the White House pastry chef by former First Lady Laura Bush back in 2007. Prior to that, he was an acclaimed dessert and pastry chef in New York. In a statement, Michelle Obama thanked Yosses for his "outstanding work," including helping to get the White House Kitchen garden off the ground, and wished him and his husband all the best for the future. Yosses told the Times that the Kitchen garden had been a huge source of inspiration to him in creating healthy and innovative desserts, and it would likely have a lasting effect on his eating habits. However, Yosses said he still very much enjoyed the deliciously sweet creations he has made on those occasions when the White House has guests. “I don’t want to demonize cream, butter, sugar and eggs,” he told the Times. Not all of the Obamas always stick to the healthiest options either. Yosses once said that President Barack Obama, a huge fan of fruit pies, has nicknamed him "The Crustmaster" thanks to his delicious pie crusts. On Thanksgiving, Yosses serves five or six different kinds of pie. When he leaves the White House in June, Yosses wants to form "a group and foundation of like-minded creative people” for promoting delicious and healthy food. Sign us up.